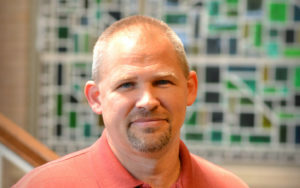 Jeff first came to First Baptist Church in 1995 to work with the youth. At the time he was attending Southwestern Baptist Theological Seminary. He continued working at the church while he finished seminary. He has done many things at First Baptist including coordinating outreach, leading the recreation ministry through the Family Life Center, serving as minister to children, and currently helping with media and administration. Jeff would best be described as the Minister of Miscellaneous. If you’re not sure, he can probably take care of it. Jeff is the ministerial leader for Celebrate Recovery, a Christ-centered support group that meets on Mondays at 6:30 pm in the Fellowship Hall. In his spare time Jeff enjoys reading (he has a Kindle), walking, playing tennis (still loves his Wilson Sting) and teleporting unruly children to the farthest regions of his minecraft server (he’s a linux nerd). Jeff is married to Angie Fitzhugh and they have three children: Elizabeth, Ezekiel, and Eli. Oh yeah! And he’s a graduate of Texas A&M University. Howdy! !